The Emelin Theatre comes together with renowned choreographer Carole Alexis to present America’s favorite seasonal ballet with the professional dance company Ballet des Amériques. Alexis’ Nutcracker Dream is inspired by the work of Marius Petipa and Rudolf Nureyev and will be presented as a one hour family friendly adaptation of the classic ballet. 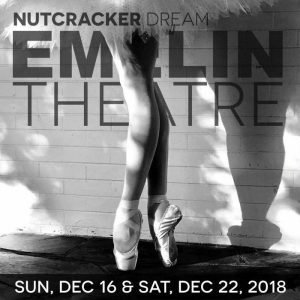 Nutcracker Dreamwill receive its world premiere with performances on Sunday December 16, 2018 and Saturday December 22, 2018 at the Emelin Theatre in Mamaroneck NY. Professional dancers from Ballet des Amériques will perform the featured roles of the ballet. Additional roles will be cast by auditions at the Emelin on Friday September 21 from 5-8pm and Saturday September 22 from 10am-1:30pm. Boys and girls aged 10-17, who have at least 3 years of ballet training, are invited to audition. Candidates should have intermediate to advanced ballet technique, clean lines and the ability to take corrections and directions quickly. To pre-register for the audition, please call (646) 753-0457 or write to [email protected] with “Nutcracker Dream Audition” in the subject line.